We all need a lucky break from time to time and that is just what you get when you play the fun, 5 reel, 15 payline surfing bonus slot Big Break. Unlike many slots that pay from left to right only, in Big Break the far right reel has a special Lucky Break wild symbol that awards additional right to left winning combinations and each win is doubled. All those times of getting 4 matching symbols in a row only to come up empty handed are gone. The wagering in Big Break is geared towards all types of players, you can wager as little as 15¢ per spin all the way up to $75 per spin. Big Break includes two fun bonus rounds, a 15 free spin bonus round and a Surf's Up bonus round. When 3 or more Monkey Wax scatter symbols stop on any of the reels you're awarded a 15 free spin bonus round. During the free spins two or more Gorilla, Lemur, Macaque, Orangutan and the Gibbon regular pay symbols act as additional scatters to complete winning combinations no matter where they stop. Plus the free spins can be retriggered. The Surf's Up bonus round is triggered when the Gorilla, Lemur, Macaque, Orangutan and Gibbon are scattered anywhere on the reels. In the Surf's Up bonus round five surfboards are displayed. You click the start button to begin the bonus round and click the stop button to choose the surfboard you want. Behind each surfboard is a random prize. The top win in the Surf's Up bonus round is 50 times your trigger bet up to 7,500 coins. Big Break also has some colorful fruit symbols to round out the pays and a second wild symbol, the Big Break. 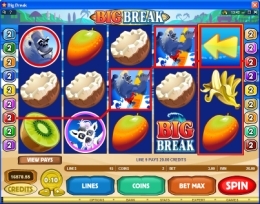 The Big Break wild symbol combines with all symbols to complete even more winning combinations except the Monkey Wax scatter symbol. What makes Big Break exceptional is the right to left pay feature.